Evan Cartwright, a Landscape Architect by profession, has always had an innate passion for the environment, particularly the natural environment of The Bahamas. As a young boy growing up in Grand Bahama, Evan found himself captivated by the terrestrial and marine environments of The Bahamas, spending most of his time outdoors and on a boat whenever the opportunity arose. 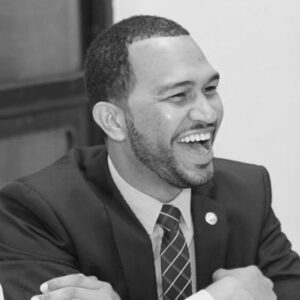 This passion for the environment has cultivated his skillful knowledge of Bahamian natural resources which has certainly served him well in his professional field. As a Landscape Architect for nearly a decade, Evan has a keen eye for modern and classical design; moreover, he attributes most of his skillful techniques to the invaluable foundation he received at North Carolina A&T State University where he was inducted into Sigma Lambda Alpha, a landscape architecture honour society which recognizes the high academic achievements of students. Continuing on the path of scholastic excellence, Evan graduated with honors from the University. Having been exposed to land planning,landscape architecture and environmental development projects all across the globe though his schooling and internship, Evan felt equipped to return home to make a contribution to the continual development of his country. He quickly began to fulfill this dream. Evan’s work portfolio extends throughout the islands of The Bahamas including the 40-acre Old Fort Bay Shopping Plaza, the newly developed Pompey Square green space and the redesign of a portion of the Garden of the Groves.